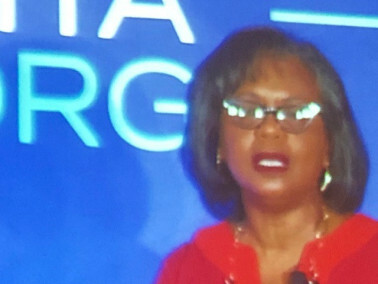 “Be authentic and do what feels right to you.” Anita Hill declared at the Grace Hopper Conference for Women in Technology. I was very fortunate to be able to attend Anita Hill’s keynote speech at the Grace Hopper Conference on September 28th, the day after the emotional testimony by Dr. Christine Blasey Ford against Judge Kavanaugh. 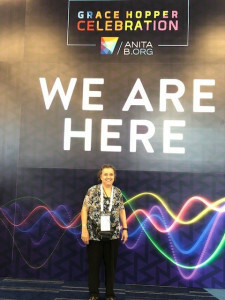 The Grace Hopper Conference for Women in Technology is an annual event, and this year it took place in Houston, Texas with over 22,000 mainly female attendees. Let me start with noting that Anita Hill is a great, inspiring speaker, the sell-out audience was listening to her every word! She talked about how she experienced a similar process almost 27 years ago. She mentioned in her introduction that she is the youngest of 13 children. She shared that she wanted to be in STEM (science, technology, engineering and math), but a counsellor discouraged her. Then she talked about the Kavanaugh hearing. She said things are a lot different now with the #metoo movement, which is helping to raise awareness of such issues. She called Dr. Ford an impressive and credible woman with a heart wrenching story, while Judge Kavanaugh displayed aggression and anger, which a female candidate could not do. When women are emotional or angry they become less credible in the eyes of men. She encouraged everyone to be an active participant and make their voices heard by voting. She also called on businesses to step in where legislators have failed, and create a safe workplace. When she finished, she got a five minute standing ovation, it was noisy with lots of high fives and comments on what an amazing woman she is!! It was a great event, with lots of valuable nuggets of knowledge to take away.